If the cowboy is the quintessential symbol of the Old West, then the cowgirl is the symbol of the New West. Dale Evans once said: "'Cowgirl' is an attitude really. The cowgirl faces life head-on, lives by her own lights, and makes no excuses. Cowgirls take stands; they speak up. They defend things they hold dear." This week we're celebrating the cowgirl spirit, with cowgirls and horses in quilts. June Jaeger has been in the quilting business for over 25 years. 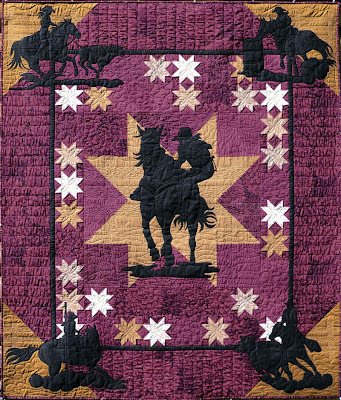 Her quilt designs feature cowgirls, cowboys, horses and other timeless images of the West. A long term resident of Central Oregon, June works at a veterinary hospital and lives on thirty-five acres in a log cabin at the foothills of the Ochoco Mountains (you can see a photo of her cabin at Log Cabin Quiltworks). She also has designed over 20 patterns for the Prairie Girls Quilt Shop of Prineville, Oregon, including "Wranglers", shown below. June was first introduced to quilting by her sister, Jean Wells. 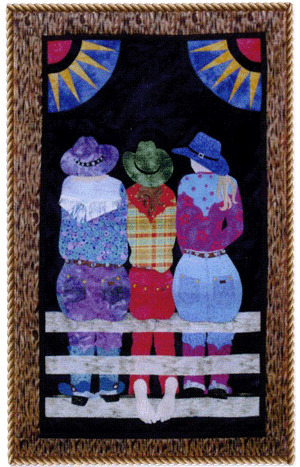 June Jaeger was the inspirational instructor for the 2011 Sisters Outdoor Quilt Show. She also designed "Timeless", the 2010 Sisters' raffle quilt; you can see the quilt and pattern at The Stitchin' Post. June Jaeger's stunning "Vision of Horses", below, won Judges' Choice at the Northwest Quilting Expo. As an entrepreneur, designer, and Westerner, June Jaeger embodies the cowgirl spirit. She says: "I am 65 years old, still cutting my own firewood, and still obsessed with quilting and teaching. There are so many quilts to design and make." Image credits: Images are shown with the generous permission of June Jaeger. 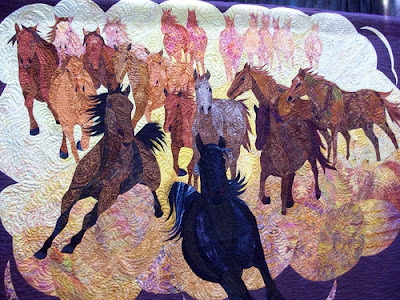 At Log Cabin Quiltworks you can also see her Saddle Up and Horsin' Around patterns, and at Prairie Girls Quilt Shop you can see Forever Sisters, Rodeo Queen and Annie Oakley.